Recommended For: Fans of high fantasy novels and, dragons, layered characters, intrigue, mystery…ALL THINGS REALLY! This book. Oh, this book. The first thing to be said about this book is that it was long oh, so long…but it was overwhelmingly fantastic and didn’t feel long, isn’t that the best thing ever?! The best thing about this book is that I was NOT prepared for the things that were unfolding because even though I do watch the HBO show, this book was vastly different and so much more in depth it was like a totally new experience reading it. I knew of the BIG THING that happened due to it traumatizing me on the show, but there is so much more to this book and I was so continuously shocked by so many things that I couldn’t put it down. The one thing that I can say for George R.R. Martin (besides the obvious – don’t get too attached to his characters) is that he has a knack for writing layered characters. 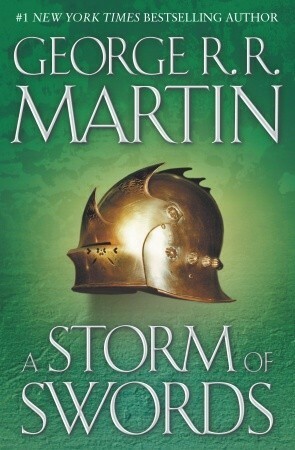 Perhaps Gregor Clegane isn’t really two sided but if you didn’t already have a soft spot in your heart for Jaime Lannister prior to reading this book, A Storm of Swords will definitely sway you to feel for him immensely. The reader can also see deeply into characters such as Arya and Jon who try their best to maintain their father’s loyal nature but due to circumstances beyond their control they must do what needs to be done to survive. I wasn’t sure that it was possible, but I love Jon Snow even more after reading A Storm of Swords. Dany is beyond amazing (how is she just 14?!) and I honestly spent so much time fist pumping at her moves. Also The Hound, I love The Hound. Let’s talk briefly about THE THING (or should I say, THINGS)…I am not going to spoil this for anyone so…well, THINGS, they HAPPEN in this book. They are jaw dropping and heart wrenching, and unbelievable. As I mentioned, I knew about the one BIG THING that was going to go down, but I had no idea that this book included so many other incredible twists and turns. Honestly, the last LINE of the last page in the entire book was mind blowing, that’s how amazing this book was. 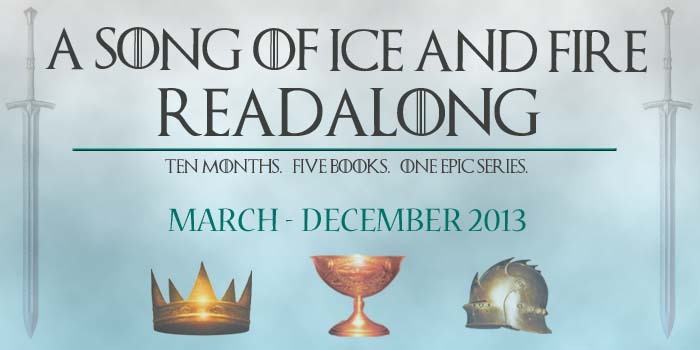 I know, I KNOW, this series is HUGE and ominous but I think everyone should give it a go because it is, well, EPIC. 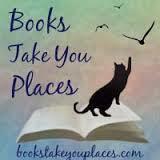 This entry was posted in Reviews and tagged adult, books, fantasy, Game of Thrones, read-along. Bookmark the permalink. Oh, Jamie! And the Hound too! I really, really loved seeing the “softer” sides of the villains. Sympathetic villains. I just LOVE it.